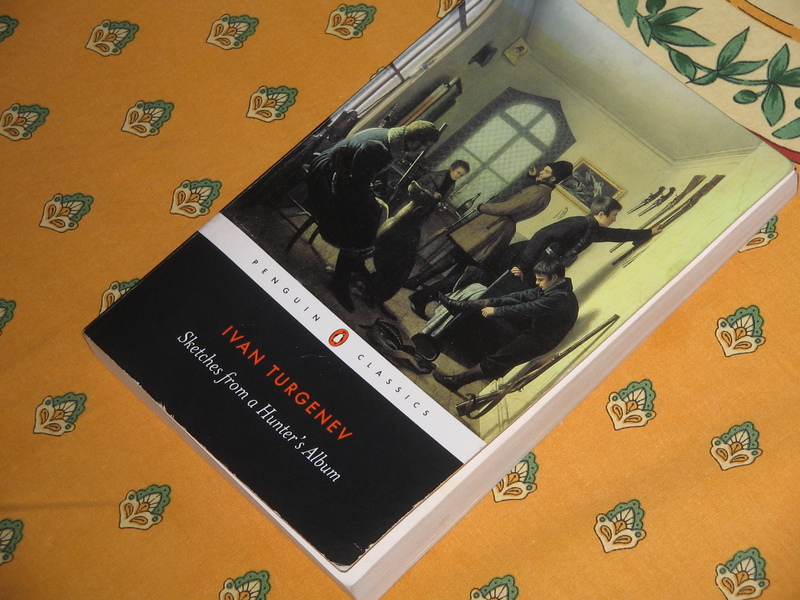 While Turgenev is generally recognised as among the major European novelists of the 19th century, his work seems curiously under-appreciated. Few readers – even knowledgeable readers – seem to have read, or even for that matter know about, any of his novels apart from Fathers and Sons and, possibly, First Love. His last two full-length novels, Smoke and Virgin Soil, aren’t even easy to get hold of in English: the translations I have – by, respectively, Rochelle Townsend and Natalie Duddington – seem to have been, till very recently, the only translations available, and they both date back several decades. The more recent translations of these works, by Michael Pursglove, seem to have passed by virtually unnoticed. Perhaps it is Turgenev’s misfortune to have been both contemporary and compatriot of Dostoyevsky and of Tolstoy: it is difficult making oneself heard when flanked by two such thunderous voices. And what makes it worse is that Turgenev’s own voice is gentle, and refined: he is not one for shouting, or for drawing attention to himself. But once one has adjusted one’s ears to the lower volume, his voice, one finds, is firm, and eloquent, and often deeply lyrical. And disconcertingly sane. No visionary moments of epiphany, no delving into the mysterious recesses of the human consciousness, no mad questioning into the nature of the universe, no vast epics encompassing movements of entire peoples, but, rather, a gentleness, a level-headedness, and a moderation that, in comparison with the work of his compatriots, can appear at first glance merely insipid. But if insipidity is indeed the reader’s first impression, it is a very mistaken one. For Turgenev’s moderation is a passionate moderation, a consequence not of aloofness nor of indifference, nor yet of cautiousness, but of a passionate belief that only through moderation can the truth be apprehended. Certainly the picture of Turgenev that emerges in Isaiah Berlin’s essay on Fathers and Sons (it is included in the excellent collection Russian Thinkers) is that of a quite remarkable man. He had grown up in an aristocratic family that treated its serfs – in effect, slaves – with horrendous cruelty: his maternal grandmother had once murdered a serf boy with her own hands simply because she was annoyed with him, and, he being her property, she could do as she pleased with him without being answerable to anyone. Turgenev’s mother was, from all accounts, also a monster: as a boy, Turgenev witnessed regularly the most atrocious cruelties inflicted routinely on serfs. He knew full well, from first hand observation, the institutionalised horrors of Russian society, and longed for radical change. And yet, at the same time, what the radicals had to offer horrified him. Moderation became for him not merely a default position, but a moral duty. Naturally, as a sane voice in an insane world, he was reviled from all sides. Relations with Tolstoy were never particularly warm, while Dostoyevsky excoriated him on every possible occasion – while not being above, it seems, borrowing money from him – and caricatured him very cruelly and unfairly (although, admittedly, also very funnily) as the author Karmazinov in Demons. It was with Sketches From a Hunter’s Album, written mainly in the late 1840s and early 1850s (with a few extra additions some 20 years afterwards), that he first made his name. These short pieces are, as he insisted, sketches rather than stories: quite frequently, Turgenev is content depicting a situation without feeling the need to extend or to develop it. Rarely is there anything that we may understand as a plot: when a character is described, it is not so that the reader can understand the character’s subsequent actions: rather, the description is an end in itself. We don’t even always get an epiphany, as Joyce was later to call it – some moment of revelation that becomes the crux of the story: a situation is been described, and characters are presented, and that, for Turgenev, is enough. However, it is noticeable that the additions made to this series in the 1870s are very different in nature: in these later sketches, there is most certainly a narrative arc, and, on occasion, narrative tension; but it is hard to say whether this change came about because Turgenev had now become more adept at storytelling, or because he had merely lost the ability to maintain interest without narrative. A bit of both, perhaps. The earlier and the later stories are different in nature, but there isn’t, I think, any question of either being superior to the other. Arkady Pavlich poured himself a glass of red wine, raied it to his lipe and suddenly frowned. “Why has this wine not been warmed?” he inquired of one of the manservants in a fairly sharp voice. The man was confused, stood rooted to the spot and turned pale. “Well, I am asking you, my dear chap,” Arkady Pavlich continued quietly, without taking his eyes off him. The detail of the servant turning pale tells us all we really need to know. Although the oppression and the cruelties are never far away, it is not really the central purpose of these sketches to highlight these matters, either explicitly or implicitly: Turgenev was not writing a Russian version of Uncle Tom’s Cabin. He was interested in these characters not as props for an ideology, but as people. And he is interested also in the landscape in which they live. I don’t think I have ever come across descriptions of light and of landscape that are quite so sheerly beautiful as the ones Turgenev gives us here: the beauty of the prose comes through even in translation (and of course, translator Richard Freeborn deserves much credit for this). The light in the forest steadily diminishing as evening falls; a hot summer day on the plains turning into darkness; the rivers, the woods, the skies – these depictions are not mere scene-setting, but integral parts of these sketches. This focus on the joys and sorrows ordinary people, and on the beauty of the landscape they inhabit, may even remind the Anglophone reader of Wordsworth, but Turgenev does not find in them, nor even seek, intimations of immortality: he is happy to see the landscape just for what it is, and take delight in it for what it is. Unlike his two great contemporaries, Turgenev’s vision of life, as far at least as may be judged from these sketches, was not in any sense religious. And in some stories, there is, indeed, great delight. In “Bezhin Lea”, for instance, one of the most famous of these sketches, the opening pages are given to the most exquisite description I think I have read of landscape and light: there is no narrative as such, nothing in particular that the story is aiming towards – the delight is simply in the glorious representation in prose of the visible world. Then, after darkness falls, the narrator comes across a small group of peasant lads keeping watch over their flocks by night; and he spends the night with them, listening to the stories and the bits of folklore the boys exchange with each other. And that is it: that is the whole story. No build-up of tension, no climax – nothing of that nature: not even some sort of revelation, some Joycean epiphany. And there is something about it that is very warm and open-hearted, and generous of spirit. Tolstoy and Dostoyevsky may have presented visions of greater depth and breadth, but one can’t help feeling that it is Turgenev who is the most companionable of this trio. The old woman shooed away the chick and Varya seized hold of her skirt. A Zola might have given us a horrific detailed description of the beating itself, but there’s something utterly chilling about Turgenev’s handling of the scene that no direct description could, I think, match. The stories range from the comic and satiric to the ironic, the sad, and, at times, the tragic. A composite picture emerges of a section of Russian society that I don’t think I have found in the works of any other Russian writer. And through it all shines the genuine decency and gentleness of the narrator. Perhaps the most touching of these sketches in “An Old Relic”, in which the narrator comes across a peasant woman whom he had previously known as a beautiful and lively young girl, but who is now paralysed after a freak accident, and spends all her life in bed, living on the charity of other peasants, and uncomplainingly waiting for death. Turgenev endows her with a nobility and a heroism. He does so not to make a point, but because he genuinely loves people. For all the evils depicted in these sketches, it is this love of the landscape, of people, and, indeed, of life itself, that comes through most strongly in this remarkable collection. Some time ago, deciding that I needed to write more about poetry in this blog (though not quite certain how to go about it), I started a series that I called, rather foolishly, “Poem of the Month”. The intentions were good: I really had meant to write about a poem each month. However, since that first Poem of the Month back in April, I have been most remiss on the matter. I suppose this blog is too freewheeling in nature – I tend to write about whatever takes my fancy, really – for any regular series such as this to be viable. However, I don’t want to give up on the idea altogether. So “The Poem of the Month” continues – as long as it is understood that it does not imply that I’ll be writing about a poem every month. Into the bosom of the steady lake. In childhood, ere he was full twelve years old. Mute—looking at the grave in which he lies! Wordsworth’s blank verse is based on underlying iambic pentameters, as is the blank verse of the two other undisputed masters of the form in English – Shakespeare and Milton. But Wordsworth sounds very unlike either: his tone is almost invariably conversational. While Shakespeare’s blank verse has an irresistible dramatic impulse (hardly surprising, given that it occurs in his dramas); and while Milton’s blank verse is grand and sonorous; Wordsworth’s blank verse seems to give the impression that he is sitting next to us, not orating grandly, but conversing – conversing in a voice that is gentle, quiet, but firm. This conversational effect is achieved partly through his avoidance of words not generally used in everyday speech (although when he does from time to time break this rule and introduces words such as “vicissitude” or “diurnal”, the effect can be electric); and also through a simulation of the kind of thing we tend to do in conversation – drifting off from one subject to another, parenthetical comments leading on to other matters so that the original subject is forgotten, and so on. Consider, for instance, the sonnet “Surprised by Joy”, Wordsworth’s infinitely touching lament for his dead daughter. The opening line strikingly tells us that he has come across an unexpected joy, but almost as soon as he starts to tell us about this, another thought – that his daughter, with whom he had instinctively wished to share this joy, is no longer there – overtakes it. The rest of the sonnet is about his loss: whatever joy it was that is referred to in the first line is now seemingly forgotten. Only seemingly, of course: a poem, especially a poem as tightly knit as a sonnet must be, cannot be as rambling as our conversation often is. But in simulating this rambling that is typical of conversation, Wordsworth gives us the impression of conversation. And he also, vitally, I think, uses this conversational mode to leave certain things unsaid. He leaves unsaid what this “joy” is that is mentioned in the opening line; however, the word “joy”, so strikingly introduced, resonates in our mind even as we go on to read of the most inconsolable grief. And the impression is conveyed of a certain joy that is present even in the midst of heartbreak – a joy that cannot be spoken about directly because our language is not designed to communicate directly matters so intangible. Much of greatest poetry does seem to me to communicate various matters that language, as commonly used, is not designed to communicate. The poet uses any feature of language he can – sounds, sonorities, syntax, and rhythm; imagery and symbolism; and so on – to communicate these various matters. Wordsworth adds to this armoury things that are mentioned as if in passing before being seemingly forgotten, but allowing these passing references to colour the rest in the reader’s mind. This particular poem, “There Was a Boy”, appeared in the 1798 edition of Lyrical Ballads, and later, in an expanded form (the form given above), in the 1805 edition. It was later incorporated into the posthumously published 1850 text of The Prelude (V, 364, et seq.) but it seems to me more effective as a standalone fragment, purely because its fragmentary nature itself communicates something important. The tone, as so often with Wordsworth, is conversational, and the opening line gives the impression that we are coming in in the middle of a conversation, and that much has already been said to which we have not been privy. It’s almost as if Wordsworth is giving a specific example of a general principle. This general principle he has presumably been discussing earlier, but that was before we had started listening, and so, we don’t know what it is. We are only allowed to hear this specific example, of this boy who had once been (and who presumably is no more), and from this specific example, we must try to infer as best we can the general principle that it illustrates. And then, in the next few lines, Wordsworth describes how this boy, in the evening, would mimic the hooting of the owls, encouraging them to answer him. Whatever the general principle was that Wordsworth might have been talking about before the poem starts, it is the specific that he details, lingering lovingly on each specific point. The vocabulary used is almost without exception the vocabulary we would use in everyday conversation, with the occasional word thrown in, such as “interwoven”, reminding us that, for all its everyday speech, this is, after all, a poem. No, not “thrown in”: carefully placed. But the conversational tone gives the impression of its just being “thrown in”. The boy, in mimicking the sound of nature, becomes interwoven with it; and nature itself seems interwoven with something else. This sense of interweaving becomes clearer in the following lines; for once the noise of the birds dies down, there follows “a silence that baffles his best skill”. “Baffle” of course has multiple meanings – to frustrate; to impede progress; and various other shades of meaning in between. All of these must be considered. The boy is “baffled” – he is perplexed by this silence; and at the same time, this silence impedes his skill in mimicking the owls, for it contains within it something that is greater – something, perhaps, “more deeply interfused”. For it isn’t complete silence. As the boy listens to this silence, he perceives in it “with a gentle shock of mild surprise … the voice of the mountain torrents”. And, moving from the aural to the visual, the “visible scene would enter unawares into his mind”. Nature itself invades the boy’s being, with “all its solemn imagery”. But if Nature itself is an image of something else, Wordsworth is again silent on what it is an image of. The boy is at this stage so much part of the Nature around him, there is no reason to distinguish any more between them. “Uncertain heaven”. What does Wordsworth mean by this? That we are uncertain whether or not the scene described really is heaven? Or that we know this to be heaven, but are uncertain about the nature of what we experience here? This ambiguity lies at the very heart of this remarkable poem, but Wordsworth, having dropped his hints, moves on. As we generally tend to do in conversation. He had “hung” listening to the silence, and had allowed himself to become part of the Nature that was around him. Now, he “hangs” again, in death; and in death, as in life, he is become a part of, and at one with, Nature, with the “rocks and stones and trees”. So great is the discrepancy here between the everyday nature of these words and the intensity of feeling communicated by them, it is hard to imagine anything more laconic and understated. And more Wordsworth will not say – presumably because more cannot be said: language is after all limited in what it can directly express. Beyond what Wordsworth has already said, he is “mute”, as mute as he is by the boy’s grave. But enough has been said to allow us a glimpse of something – something that the poet may have been talking about before we joined his conversation. This post is intended as part of the celebration of Spanish Literature organised by the book blogs Caravana de Recuerdos, and Winstonsdad’s Blog. If you haven’t yet visited these two blogs, may I warmly recommend them both. I’m not sure why translator Abigail Lee Six translates Tormento, the original Spanish title of the novel, as Inferno: there is no explanation given in the introduction, and there are no explanatory notes at the end. Even though I don’t speak Spanish, Torment would surely, it seems to me, have been a closer translation, and would have suited the content admirably. However, I was not going to allow what I trust is a minor quibble to put me off this book. From what I have read so far, Benito Pérez Galdós is among the finest of 19th century European novelists, and his relative neglect outside the Spanish-speaking world seems to me inexplicable. Translations of his novels are hard to come by: even Fortunata and Jacinta, generally acknowledged to be his masterpiece, seems to go in and out of print. There have been translations also of a handful of his other novels, but they are not always very easy to get hold of, and so, whenever I find any translation in some second-hand shop, I tend to pick it up immediately without further thought. This one has been on my shelf for about a year or so now, and when Richard from Caravana de Recuerdos and Stu from Winstonsdad’s Blog suggested a Spanish literature month, it seemed an admirable opportunity to catch up on it. The novel Tormento (I might as well use the original title) was published in 1884, shortly before Fortunata and Jacinta. The scope is considerably narrower, but the social context is familiar – not merely from the other novels by Pérez Galdós, but from the works of virtually any 19th century European novelist you may care to mention. The novel starts in the form of a play: two people bump into each other in the streets of Madrid, discover that they know each other, go together to a nearby café, and have a conversation about various other people. It’s these various other people the novel then focuses on, consigning the two people we meet in the opening chapter to the periphery of the action. I don’t think I have come across an opening gambit quite like this, and I must admit I am not sure of Pérez Galdós’ purpose in doing this. Perhaps the intent was merely to provide a contrast to what follows – of leading us to expect a certain kind of novel and then confounding those expectations. For in that conversation in the opening chapter, we find that one of these two characters writes a popular serial in a journal: from what he says of it, what he writes is very sentimental and melodramatic. But, after that first scene, Pérez Galdós takes us into a very realistic milieu, far removed from any hint of melodrama or sentimentality. We are presented with a picture that we may expect perhaps from a Balzac novel: there’s a middle class family, shamelessly buttering up a wealthy cousin and happy to accept whatever droppings they can from his table; there’s that wealthy cousin himself, a businessman who has made his fortune abroad and who, despite his wealth, knows nothing of the niceties of Madrid society; and there are two other cousins, sisters, from a good family but now fallen on bad times; one of these sisters is obviously turning to prostitution, while the other, Amparo, is horribly exploited by her middle-class cousins, who treat her with a sort of baronial condescension. All this is very well done, and presented with wonderful irony and psychological insight, and with a Balzacian awareness of how society is structured. However, I must confess that I, as a reader, found myself feeling somewhat detached from it all. Truth is, after a certain stage of novel-reading, one can easily get a sense of déjà vu with this sort of thing. Horrible, selfish and exploitative social climber; nouveau riche unaccustomed to the niceties of high society; people from good families down on their luck and struggling to keep their heads above the water … we’ve frankly seen them all before, And I suppose, speaking subjectively, I no longer find such things of any great overwhelming interest: all those things I know I should admire – awareness of the social and financial structures, detailed observation, social criticism – increasingly seem to me relatively minor matters, at least as far as the art of the novel is concerned. Perhaps I have just become blasé about these matters, but depiction merely of the surface of things, no matter how detailed in its observation and understanding, I nowadays find, frankly, a bit boring. However, Pérez Galdós pulls the rug from under our feet once again, and this one I hadn’t been expecting. For the rich, unsophisticated cousin, much to the chagrin of the horrible middle-class social climber, falls in love with and proposes to one of the impoverished cousins. And at this comparatively late stage of the novel, the narrative takes a somewhat strange turn: for this impoverished cousin, Amparo, has a secret. This secret does not amount to much in our own times, but in the conservative Madrid society of the 1860s, it most certainly did: for Amparo is no virgin: she has, in the past, had an affair, and her former lover, now ill and also fallen on hard times, harbours for her still a violent passion that verges on insanity. I can’t think of any other novel that changes tack so radically at so late a stage. This former lover is introduced when we are already some one third of the way into the novel, and the effect is like stepping from a novel by Balzac straight into Wuthering Heights. What follows is startlingly intense: at one point, the paintings of El Greco and of Goya are evoked, and the evocation did not seem out of place. And the narrative is unashamedly theatrical: the climactic scenes where Amparo visits her lover, though written in the form of prose narrative, are theatrical in a way the opening scene, written like a playscript, certainly was not. 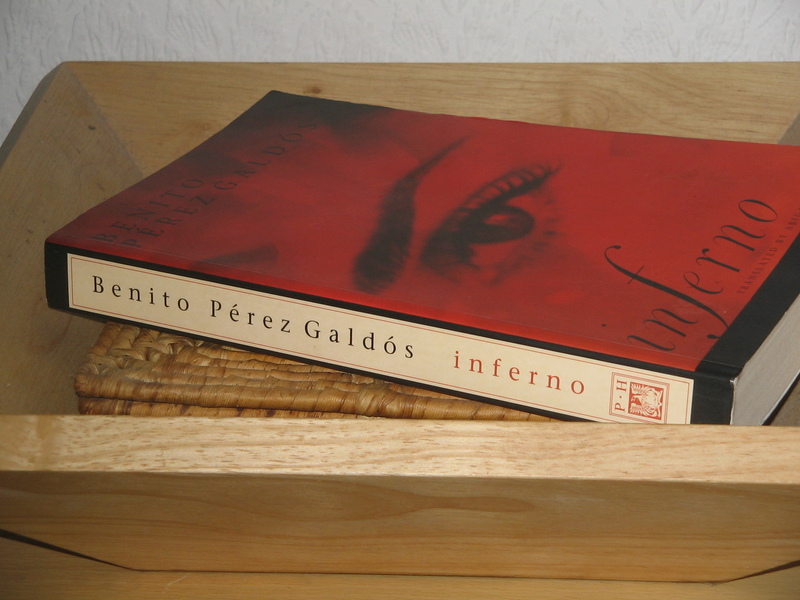 Her former lover had called her Inferno during the affair, and calls her still by this name (although this name too, like the title of the novel, may have been Tormento in the original Spanish). He had been a priest – a Man of God who, he knows, has damned his soul by his passion. Yet, startlingly vivid though this character is, it is not he, but Amparo, whom Pérez Galdós places at the centre of the canvas: the “tormento” of the original title, or the “inferno” of the translation, is located inside Amparo’s mind. Having depicted the surface of things with such detail, Pérez Galdós takes us deep inside the mind of a woman at the end of her tether, a woman suffering the torments of hell itself, right up to the very point of attempted suicide. After a series of quite seismic climactic scenes, Pérez Galdós expertly winds the tension down for the final pages. And he finishes again with a scene written, as with the opening chapter, in the form of a playscript. But the real drama at the centre of it all, the real “theatricals” of the piece, is written in the form of prose narrative. It seems curious that at a time when Ibsen was claiming for drama material more usually associated with the novel, Pérez Galdós was claiming for the novel material that is in its very nature theatrical. For all its considerable merits, Tormento (or Inferno, as you will) is perhaps among Pérez Galdós’ lesser works: it lacks either the panoramic scope of Fortunata and Jacinta, or the visionary quality of Nazarin or of Misericordia. There are elements of it that still leave me puzzled: I am still not sure why Pérez Galdós should present it as a certain kind of novel before transporting us so abruptly into so radically different a fictional world. But the achievement remains considerable. Pérez Galdós is often described as the Spanish Balzac, or the Spanish Dickens; but his works stand up well enough on their own merits, I think. And yes, he most certainly deserves to be better known. I’d been asked by Fran Wilson, who writes the excellent music blog “The Cross-Eyed Pianist”, to write a guest post on how I relate to classical music. I naturally saw this as an opportunity to indulge in self-indulgent verbosity, but Fran very kindly put it up anyway on her blog. You may read it here. It was in the summer of ’78, when I was still recovering from a particularly traumatic World Cup campaign, that I first visited Stratford-on-Avon. I went with a couple of friends, one of whom, I know, looks into this blog from time to time. It was, for me, a sort of pilgrimage, I suppose – sacred ground. We had tickets booked for Love’s Labour’s Lost. I wasn’t entirely happy with this, I remember: I would have preferred a better known play – Hamlet, maybe, or Richard III, or some such. I wasn’t to know that this particular production would be regarded in years to come as one of the great theatrical landmarks, and that, some thirty-six years later, I would be boasting – admittedly, to indifferent listeners – that yes, I was actually there. John Barton directed a splendid cast, featuring Michael Pennington and Jane Lapotaire as Berowne and Rosaline, Michael Hordern as Don Armado, and a supporting cast that included such future stars as Richard Griffith, Juliet Stevenson, and Alan Rickman. My first evening in the Royal Shakespeare Theatre was an evening of sheer perfection. While we were there we saw another play that, at the time, was new to me: Measure for Measure, featuring Michael Pennington as the Duke, Paola Dionisotti as Isabella, and Jonathan Pryce as Angelo. I remember sitting in the back row of the gallery, looking down from a great height on to the stage (I was an impecunious student, after all), and wondering why, despite regarding myself as a Shakespeare nut even then, I did not know a play so utterly spellbinding as this. All in all, that first visit was a huge success. I have been back to Stratford several times since, of course: it is, after all, a mere two hour drive up the motorway from where I now live, and the internet has made it much easier to book tickets. Over the years, I have seen there performances of Romeo and Juliet, A Midsummer Night’s Dream, Twelfth Night, Othello, Antony and Cleopatra … and, on one glorious day back in ’91, both parts of Henry IV on a single day – Part One in the matinee show, and Part Two in the evening. There have been some changes, of course, to the place: the main theatre has been completely refurbished, with the old proscenium stage now replaced with an apron stage coming out into the auditorium. However, the centre of the town remains much as it was, with the riverside gardens stretching between the Royal Shakespeare Theatre and the Shakespeare memorial, the spire of the Holy Trinity Church, where Shakespeare is buried, visible down-river. The birthplace itself, in nearby Henley Street, has been maintained to look much as it has looked for centuries, I guess. There’s New Place, where Shakespeare, retired from London, lived in his later years; and there’s still that delightful walk through parks and fields to Anne Hathaway’s cottage. Neither is there, contrary to some reports I have heard, any great evidence of “tourist tack”. Of course, it caters for the many tourists who visit: it can hardly do otherwise. But I can find little that I would describe as “tacky”, or “schmaltzy”. In short, the whole place remains as delightful as when I had first visited. Peace, good Doll! do not speak like a death’s-head; do not bid me remember mine end. Falstaff is obviously a very intelligent man, but in Anthony Sher’s performance, he appears utterly deluded on one vital point: he picks up not the slightest hint of the disappointment that is awaiting him. Possibly the love he has for Hal blinds him to what should really have been blindingly obvious. In the famous play-acting scene in Part One, Falstaff plays Hal while Hal plays his own father, and Falstaff, as Hal, pleads with Hal, as the king, not to banish Falstaff. “I do, I will,” replies Hal. I remember Robert Stephens as Falstaff realising during that play-acting scene that something wasn’t right – that this wasn’t quite play-acting any more: and his pleas not to be banished were genuine and heartfelt. But Sher’s Falstaff is utterly blind to any of this: right up to Hal’s devastating words, he is putting on a show. And when Hal’s words do come, he is not sure what to make of them: it is all too easy for him to think of them merely as part of the show they were putting on. 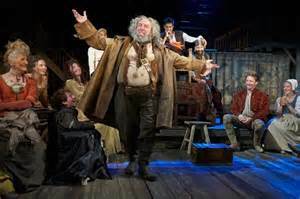 For Anthony Sher’s Falstaff is a showman. He knows full well that not only is he witty in himself, but the cause that wit is in others. Sher delivers his lines with the comic timing of a stand-up comedian. And indeed, as these plays progress, he often has to do what are, effectively, stand-up routines directed at the audience. They have to be directed at the audience because the one person who is capable of appreciating his wit, Hal, is not there: from the middle of Part One onwards, Hal, no doubt knowing what he ultimately has to do, keeps his distance. In Part Two, Hal does at one point visit his old haunt, and sees Falstaff again; but, almost immediately, message comes from the court, and Hal, now more aware of his responsibilities than he had previously been, leaves. And in Alex Hassell’s performance, it doesn’t cost Hal much effort to leave: in this interpretation, Hal has already accepted the immense responsibilities he knows are on his shoulders, and this visit to the Boar’s Head tavern but serves to confirm to him how far removed from all this he is now. In the 1991 production, Michael Maloney’s Hal had found the rejection of Falstaff a struggle: in rejecting Falstaff, he was, after all, rejecting a part of himself. But Hal here is made of sterner stuff: he has already outgrown Falstaff, and harbours no sentimentality about past friendship. But for Falstaff, his love of Hal is everything. It is not merely that he was expecting a position in court: more importantly, he was expecting Hal to return his love. But now, rejected, he must remember his own end: the grave does indeed gape for him three times wider than for other men. He tells Shallow – and, more to the point, he tells himself – that Hal will call for him shortly in private; but the man who used to spin the most outrageous of lies at the drop of a hat can no longer even lie convincingly even to himself. Shakespeare had made no attempt earlier to gloss over Falstaff’s predatory nature: we know Falstaff precisely for the deeply reprehensible person he is. And we know that Hal’s decision is, morally, perfectly correct. And yet, this scene, no matter how it is performed, no matter how it is interpreted, breaks the heart: we leave the theatre lamenting what we know is right. The chimes at midnight are mingled chimes. At the heart of these plays, I think, are those scenes in Gloucestershire. There is little reason in terms of plot to have those scenes at all: they do not contribute to the plot, and neither do they have what we may describe as “dramatic tension”. But Shakespeare knew what he was doing: even at so early a stage in his career, he was writing a new kind of drama, which, even now, perhaps, defies analysis. And those scenes were superbly done here. Twenty-three years ago, I had seen Robert Stephens and David Bradley as Falstaff and Shallow; this time, the parts were taken by Anthony Sher and Oliver Ford Davies. Different, but equally wonderful. And Mistress Quickly now was played by Paola Dionisotti, whom I had seen in the same theatre on my first visit to Stratford some thirty-six years earlier, giving a thrilling performance as Isabella in Measure for Measure. It all seemed to add an extra layer of meaning to Falstaff’s and Shallow’s ruminations – poignant and farcical at the same time – on the passing of time. After Falstaff’s rejection in the final scene, which I knew would happen but which choked me up all the same, I came out of the theatre, and, before driving home, sat by the river for a while, trying to digest what I had seen. Heaven knows how many times I have experienced these plays – on the page, on stage, on television, on audio recordings; but each time, the experience really does knock the stuffing out of me. I suppose, if I were to go out of my way to be critical with this production, I could find one or two faults: I would question, for instance, the idea of presenting Hotspur as so charmless and boorish a character. Trevor White as Hotspur certainly had a fine stage presence, and projected a sort of manic energy; however, presenting Hotspur in such a manner did mean that we felt little sense of loss at his death, and those heart-stopping final words of his passed for very little. However, given the sheer magnificence of these productions, it is churlish to cavil. I could quite happily go back and live through these two plays all over again.